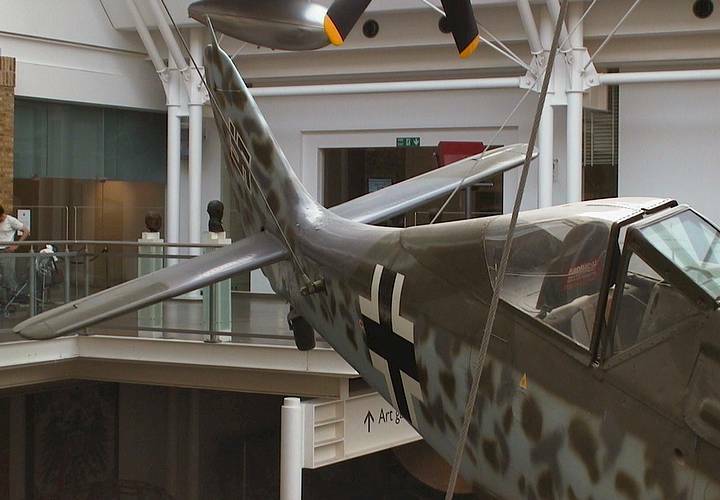 This was the finest warplane to which Germany gave birth. Evolved basically as an alternative to the Messerschmitt Bf 109 fighter, it may never have been allowed by the Reich officialdom had it not been for the choice of a non-strategic (yet controversial) radial engine. It’s prototype first flew on June 1,1939 and production deliveries began in late 1940. As is widely known, it suffered an extended period of teething troubles: engines catched fire, hydraulic systems leaked, propellers failed, exhaust gases poisoned the pilots, cowlings flew off at high speeds, canopies jammed in emergency… in fact it was so troublesome that the entire development programme almost got cancelled with the pre-production series. But after a multitude of changes, production was approved just in time for it to enter aerial combat over the Channel in the summer of 1941. There, it immediately made the Spitfire Mk. V obsolete, causing the Fighter Command’s so hardly gained self-confidence to plummet down to new lows. For four consecutive years it kept even or ahead of Allied fighters through successive versions, always retaining its sparkling flying qualities combined with superior armament and legendary ruggedness. It also excelled in the ground attack role, replacing several other aircraft types in the process, including the Ju 87 Stuka. 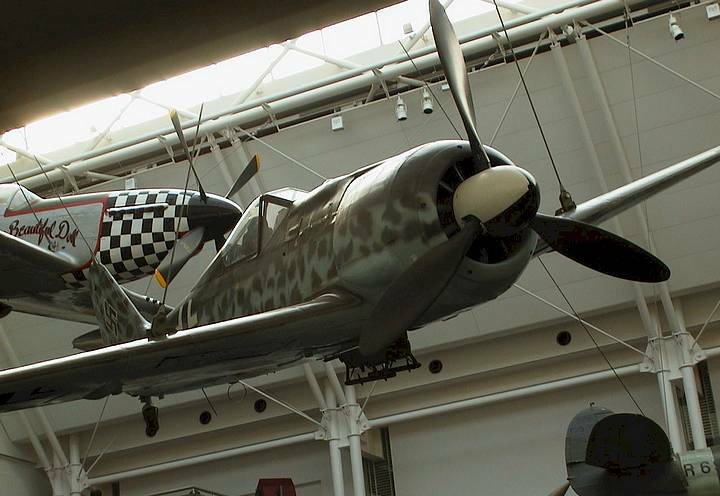 It stood for about 40% of German single seat fighter production, but unlike the Bf 109, remained highly competitive until the very end of the conflict. 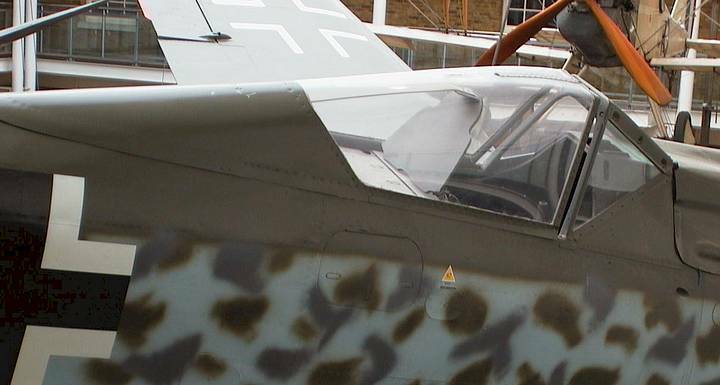 This remarkable product of the Focke-Wulf Flugzeugbau profoundly influenced fighter thinking in other countries. In Britain, it is directly responsible for the specification F.2/43 to which was designed the Hawker Fury, and F.19/43 which produced the Folland Fo.118 fighter project, also owing much to the German design. In Soviet Union, the highly successful Lavochkin La-5/La-7 line of fighters bear the same resemblance. Today, I guess it ranks among the top three aircraft modelling subjects of all time. It deserved it. I’ve been to this subject before (see Focke-Wulf Fw 190 A-8 in Detail from October 1997 – Ed. ), now it is time for a more thorough inspection of this fabulous machine. The photos presented here are all-new. 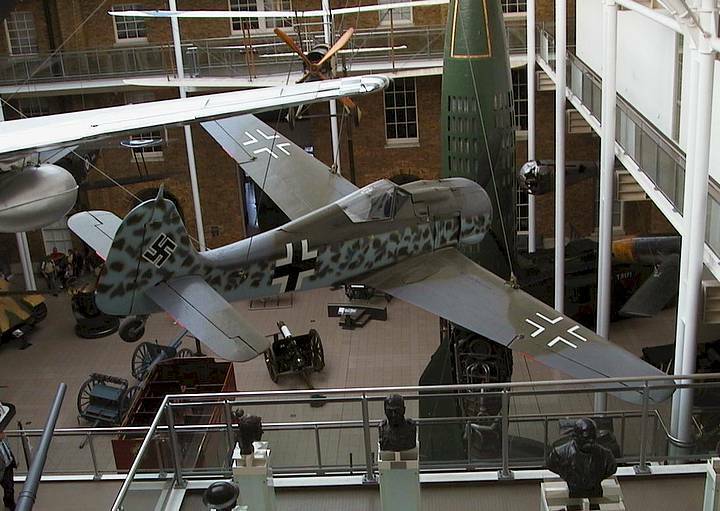 The RAF Museum in Hendon has a Fw 190 S-8 Werknummer 584 219. Built by Arado in Warnemünde, it started its operational career as a single-seat Fw 190 F-8/U1. After being withdrawn from combat service, it was rebuilt to two-seater trainer and served with Jagdfliegerschule 103. It was captured in Schleswig-Holstein by the British in May 1945, and brought to Britain in September 1945. 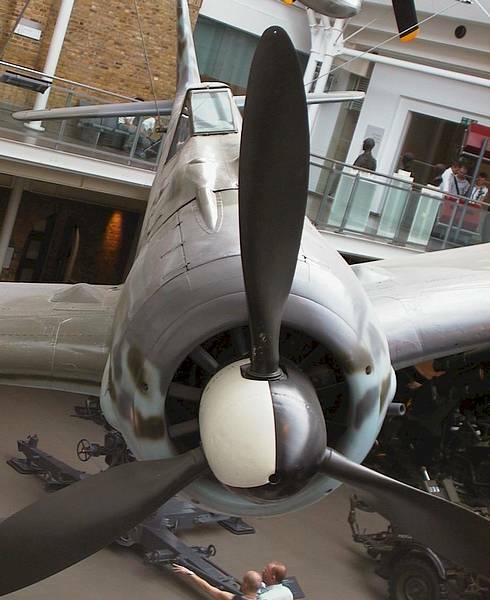 Additionally, London’s Science Museum has a nicely exposed BMW 801 engine and cowling in its huge collection of aero engines. These two aircraft are examined in the photo sections below. So here she is again. 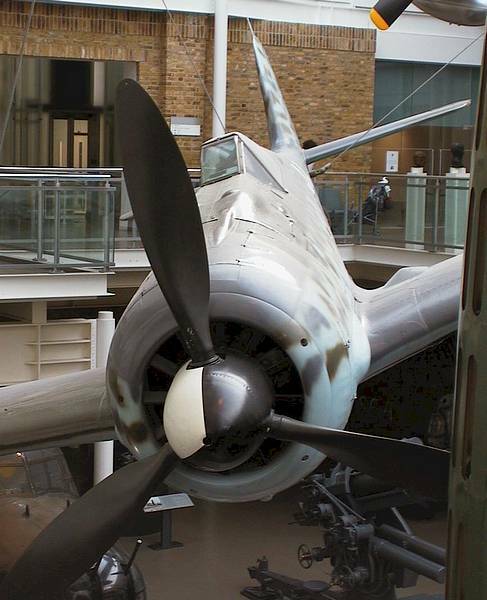 Suspended from the ceiling of the Imperial War Museum’s main hall, this Focke-Wulf Fw 190A-8 is one of the very few preserved complete aircraft of the type in the world. She hangs there in the worthy company of her great adversaries, the Spitfire and the Mustang. 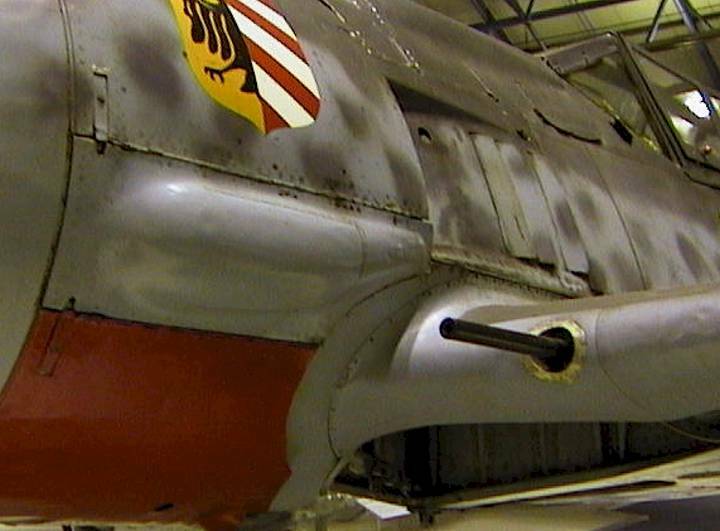 This machine is officially recorded as Fw 190A-8/R6, but as we will see, there are one or two interesting discrepancies from what is regarded as A-8 ”standard” in the literature. 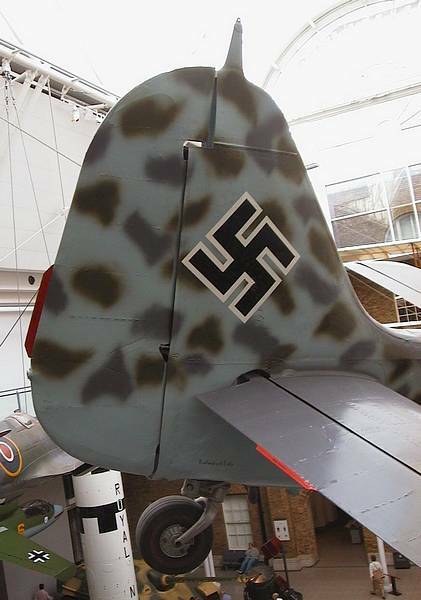 The aircraft, Werknummer 733682 was captured in Germany towards the very end of the war and brought to England in November 1945 for test and evaluation. 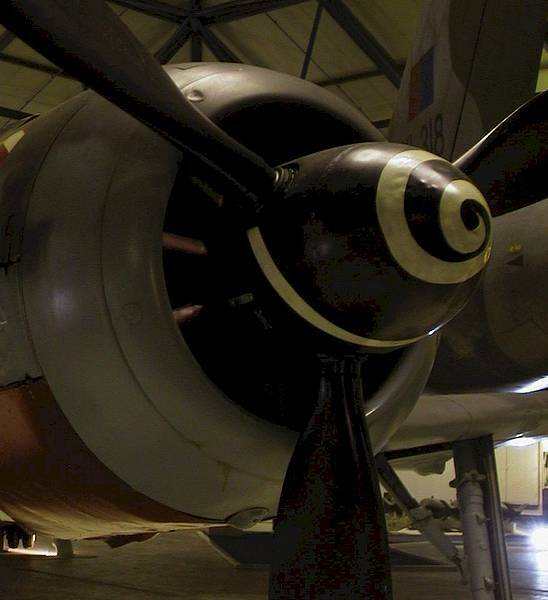 It was housed at various RAF stations before arriving at the museum in 1967. 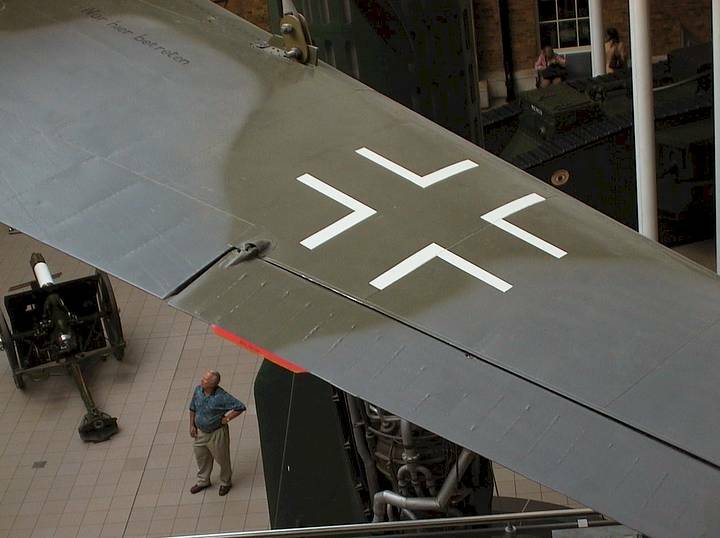 While in Germany, it allegedly flew with II KG/200 and was the top component in a Mistel S-3B (Ju 88H-1). All gun armament has been removed from this machine, of which the A-8 carried a respectable array: four 20 mm guns in the wings, two13mm calibre guns in the fuselage plus two underwing rocket tubes. Only the extra fuel tank/bomb rack remains. The seat in this aircraft is original, and so appear to be the seat belts. 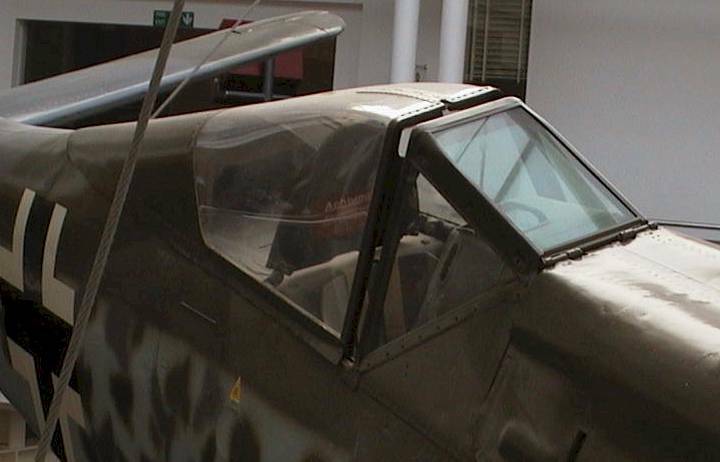 The cockpit lacks a gun sight, its aperture being visible just behind the angled windscreen frame. Behind the pilot there is a hatch providing access to the luggage compartment. Armoured headrest. The braced-style armour plate like this one was retained from A-4 to A-8 production models. View alongside the spine towards the tail. 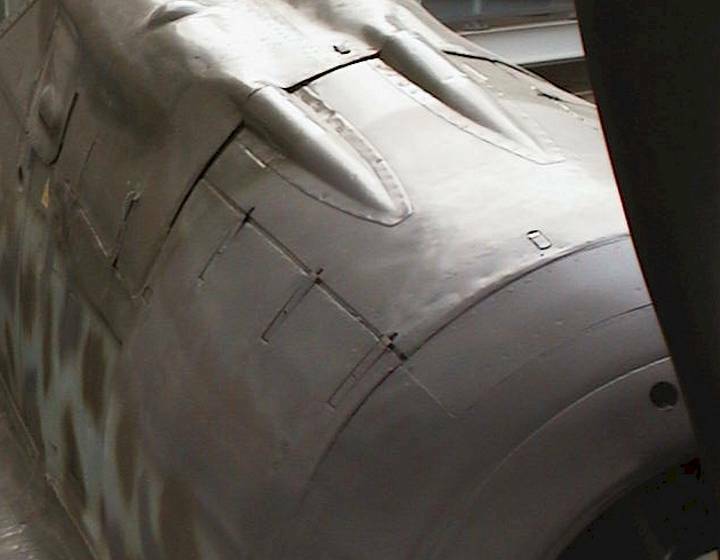 A designed-in feature of the earliest variants of the Fw 190 was the dead straight top contour of the moveable part of the canopy, from top of the frame to its rear end. As a result of pilots’ requests for more headroom during the early service of the aircraft, the transparent part was subtly enlarged, albeit it is today still referred to as ”straight” canopy. It can be seen in this view that the top outline of the canopy has become more sophisticated, deviating from the original straight line. The thickness of the glass of the armoured windscreen (50 mm) can be actually clearly seen from some angles. The hinge at its bottom edge belongs to the gun compartment cover, which opened upwards and rearwards. The tight fit of the rolling canopy contrasts with a rather loose fit of the cowling panels. Extra access panel and fuel tank in line with the cockpit . The access panel in this position was peculiar to A-8 model. 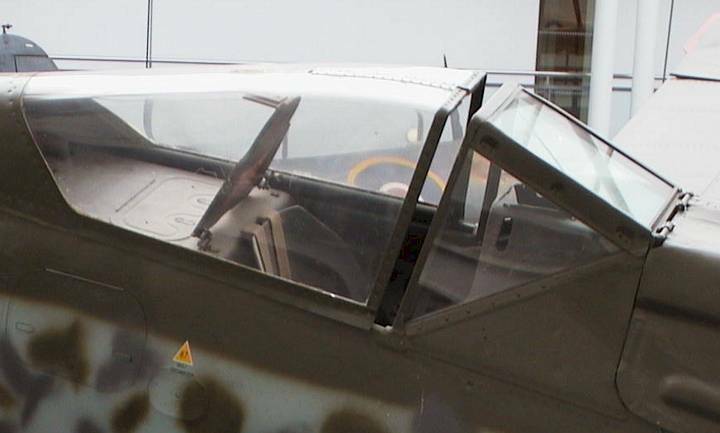 The MW50 installation itself required a sizeable methanol tank, for which the Focke-Wulf engineers found a place in the fuselage behind the cockpit, in line with the radio hatch. The installation could be accessed from below through a semi-circular cover shown here. This panel is a distinctive feature of MW50-equipped A-8 and later variants as compared to non-boosted A-1 through A-7. 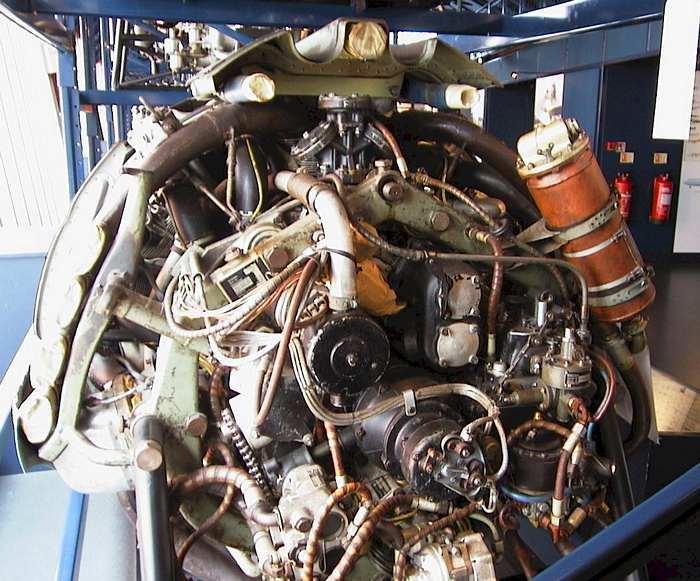 A curiosity is that the MW 50-compatible engine was available already with the A-4 model but the installation itself hadn’t been available until the A-8. Other details worth noting in this view are: the footstep below the port wing root fairing and the flare dispenser on the fuselage centreline. Sometimes a close inspection of an aircraft can tell a lot about its development history, and so even in this case. 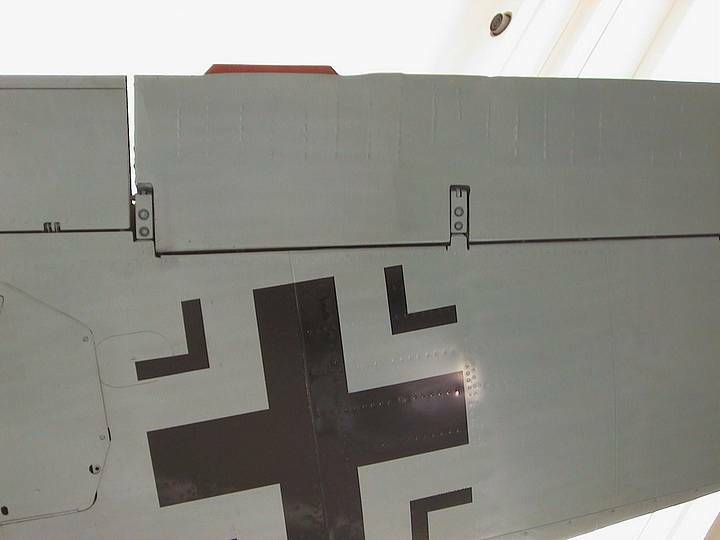 The nose of the Fw 190 has been stretched some 5 inches with the A-5 model, to remedy a growing CG problem caused by heavier wing armament and equipment in the fuselage making the aircraft tail-heavy. It is evident in this view just how much length has been added. The curved cutout in the cowling’s rear edge was originally designed to accommodate the wing root fairing. 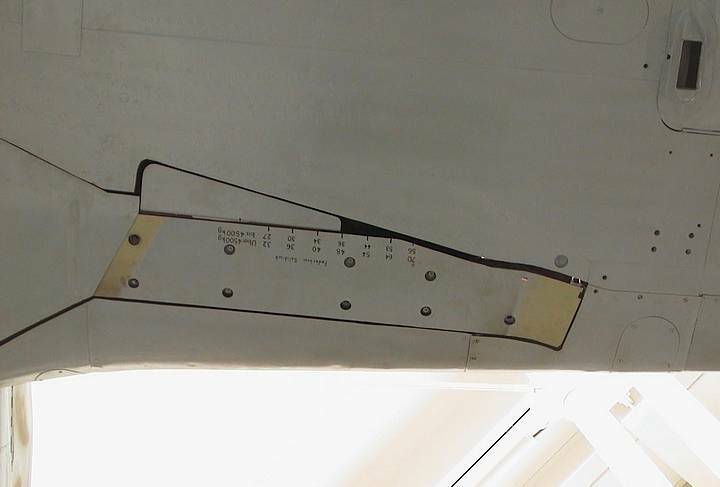 Although the fuselage was stretched, the cowling parts remained unchanged, resulting in a gap shown. Upper wing surface. This aircraft lacks the upper wing blisters of the outboard MG 151 cannon, often attributed to the A-8. Although I do not have an explanation to this, it was a common practice within the Luftwaffe to remove outer guns of the Fw 190 to save weight and improve performance. An experienced pilot could do without them anyway due to the better overall accuracy of the fuselage-mounted weapons. Note that the ailerons are fabric-covered. Detail of the lower port wing. Here, the bulged cover and spent shell outlet of the MG 151 is in place as expected. 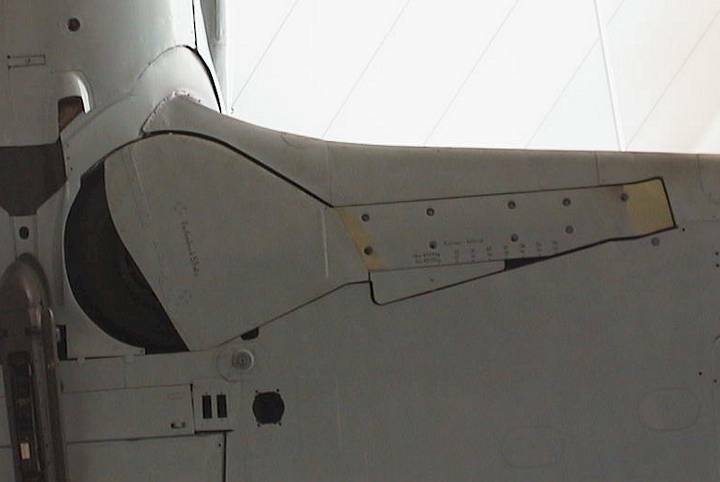 Close-up of the upper wing surface showing riveting. Note also the aileron hinge. Leading edge panels are affixed with screws! Lower wing surfaces showing the general detail of the area and the retracted undercarriage. 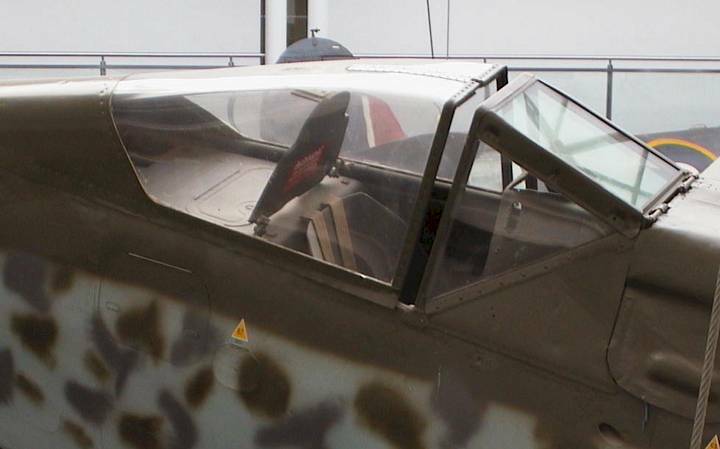 Unlike the early Fw 190 variants, A-8 did not have the wheels fully covered when retracted, the inner doors giving way to the fixed profiled panel in the middle giving the wheel wells a rounded appearance. Note the loose panel lines around the rear centreplane. The elongated rectangular panel beneath the bomb rack covers ammunition boxes for the belt-fed wing cannon, which were inserted from below. 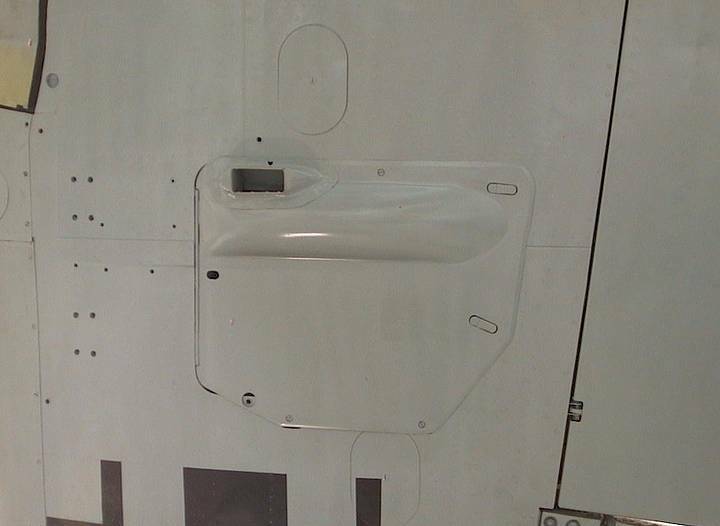 Behind it, another loosely fitting panel provided maintenance access to the fuselage fuel tank. Aileron hinges are much more prominent in the lower view. Profile of the lower wing section. 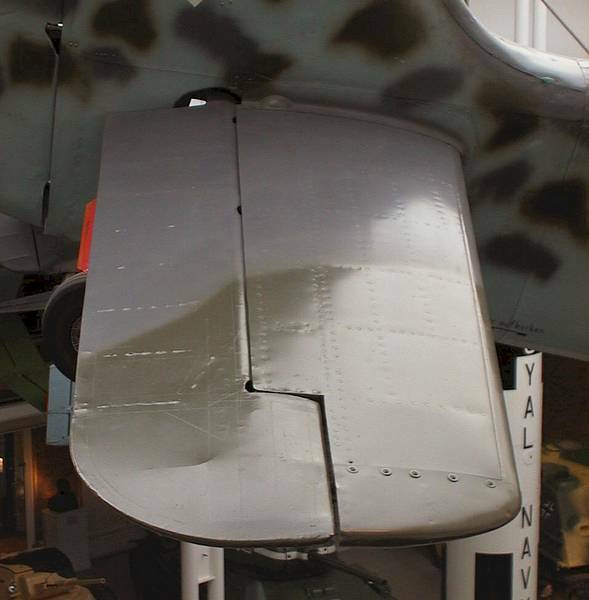 A peculiar feature of the Fw 190 was the very thick base of the fin. 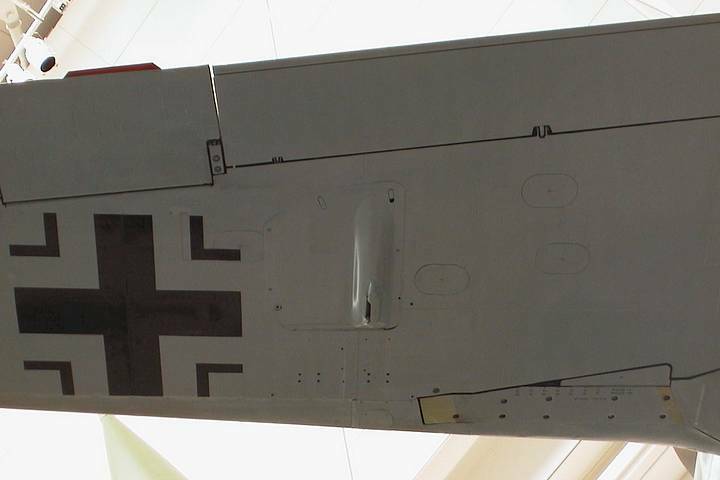 View of the vertical tail. The rudder is fabric-covered, as are the elevators. 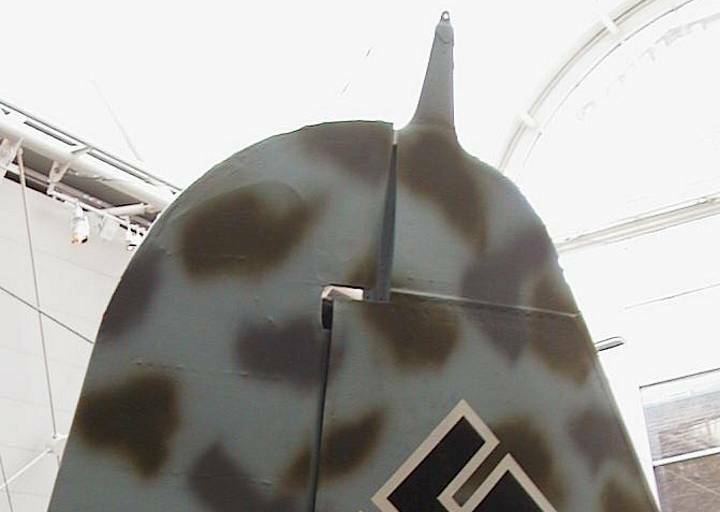 The small antenna mast on top of the fin first appeared with the Fw 190 A-4, when the radio was upgraded from the initial FuG VII to the improved FuG 16 type. A curiosity for modellers: note the ”raised” panel line across the top of the fin. Detail of the horizontal tailplane. 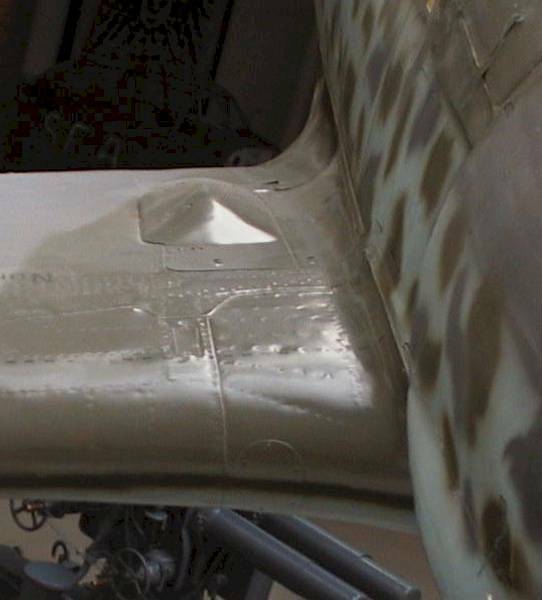 The structure of the riveted surface is well visible from this angle. 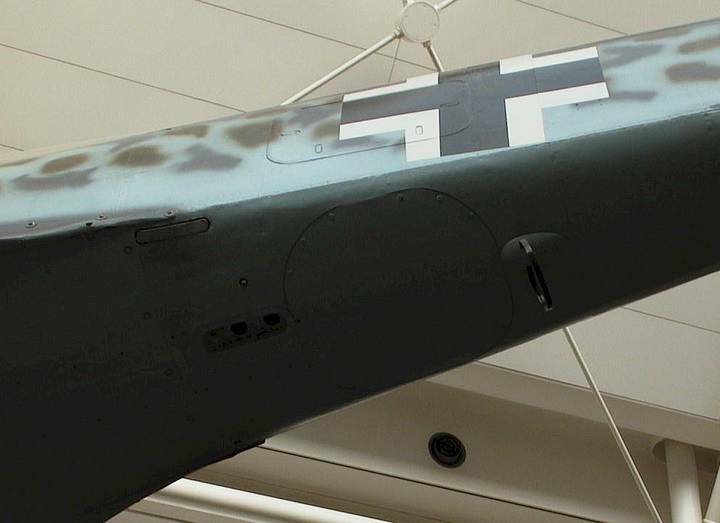 When first designed, the Fw 190 cowling was an absolute novelty in aerodynamics. Prior to its introduction, all aircraft used the NACA cowling, which although effective in reducing drag over uncowled engines, could not provide sufficiently small frontal area to fit the requirements of a fighter. 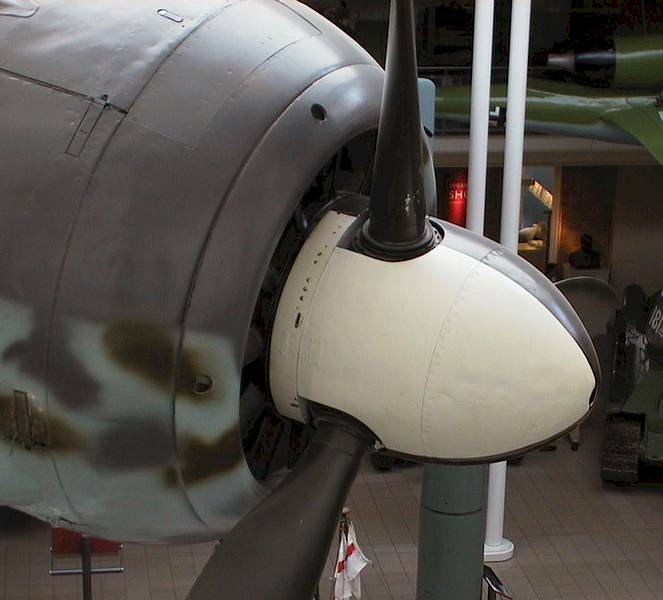 Focke-Wulf was first with the ingenious solution of power-driven cooling by means of a fan fitted to the propeller shaft. However, perfecting the solution cost a lot of engine fires on early production models. 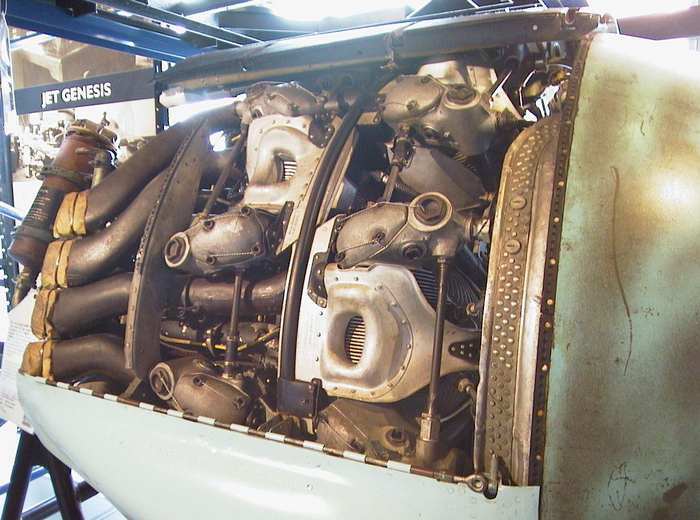 The fan proved to be just sufficient for the front row of cylinders of the BMW 801 engine, but not for the rear ones which on the early production models frequently overheated causing engine fires. Detail of engine exhaust and cooling vents. 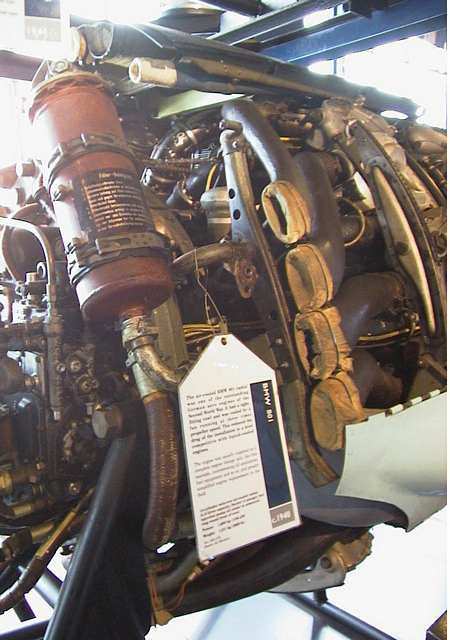 The adjustable cooling vents shown here were introduced with the late A-4 production batches, and presented the final solution to the engine cooling problem. They were retained retained on all subsequent models. The bulges on the cowling are another part of the cooling solution – they are air channels to improve cooling of the rear cylinder row of the engine. 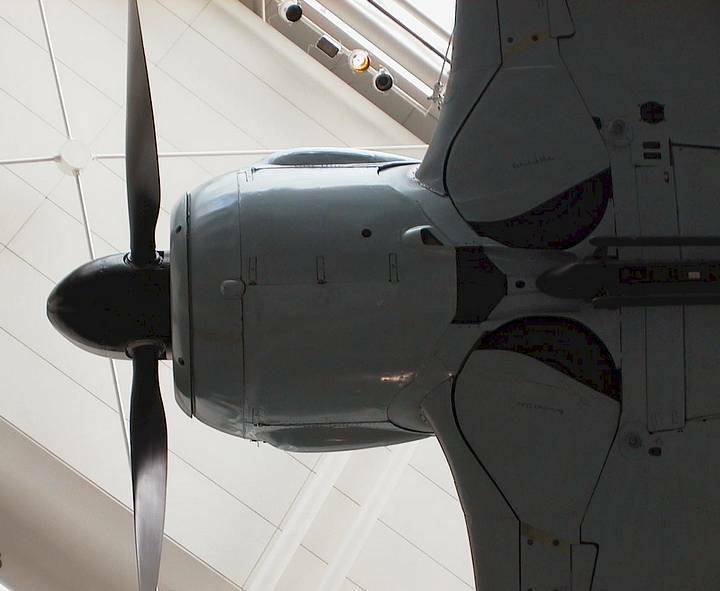 View of the propeller, showing an almost-plan view of its top blade. 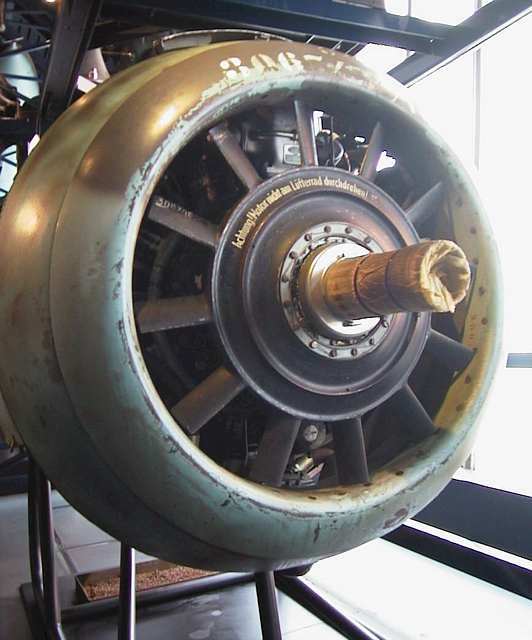 The VDM type metal propeller shown here was common for all A, F and G models except the A-9 and F-9 which featured a broader-chord wooden prop. Spinner and oil collector ring. The circular oil tank was pressed from armour plate and formed a separate forward part of the cowling. 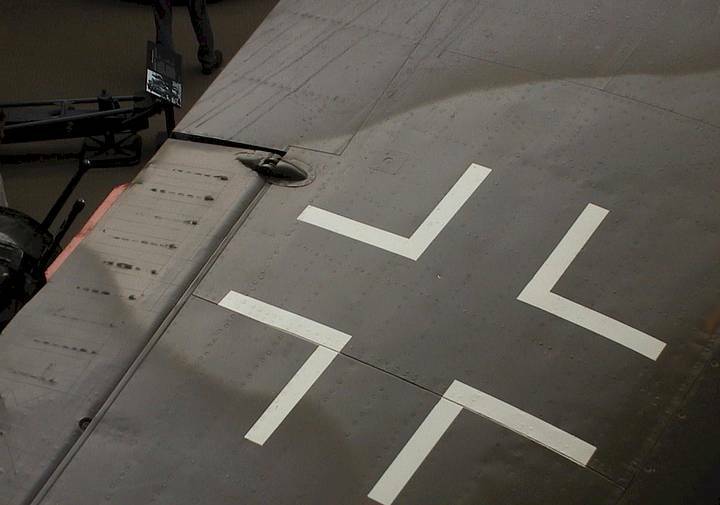 What would be a Focke-Wulf fighter without a spiral on the spinner? 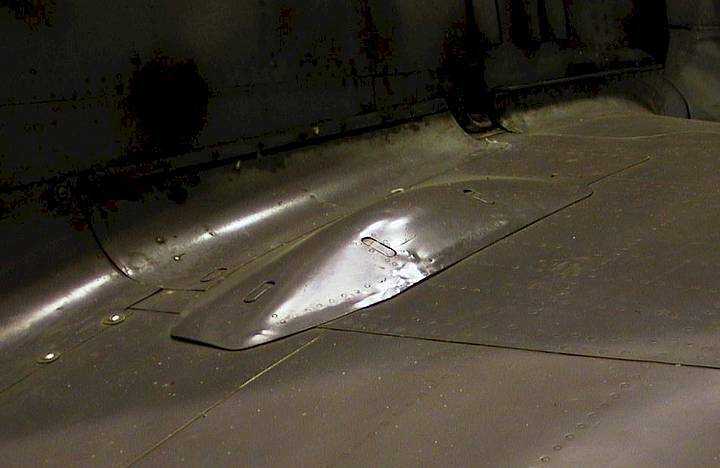 This one is battered quite badly, a not uncommon occurrence even on operational aircraft. 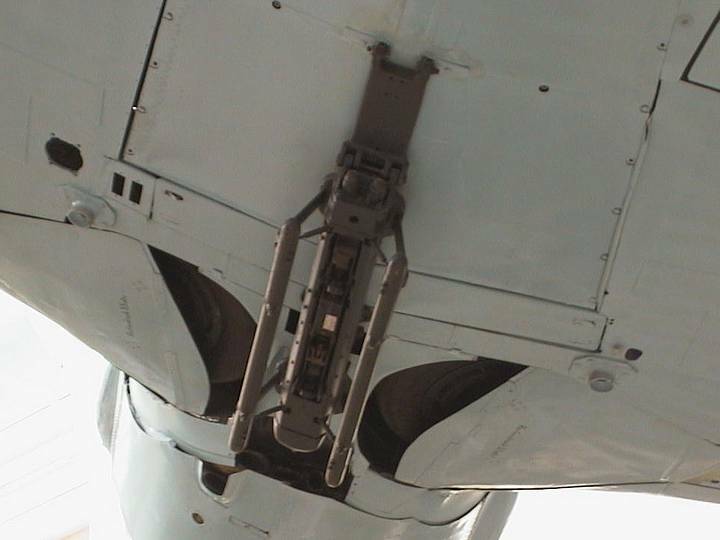 Detail of the cowling and the quick-release fasteners. Cowling shape viewed directly from below. The exhausts of the BWM 801 engine were cleverly led into three groups: on on each side of the fuselage and the third below the fuselage, between the wheel wells. 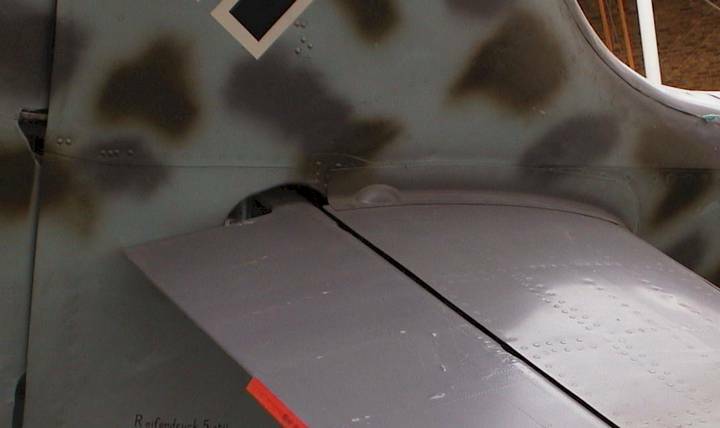 The space in this area was so confined that the Focke-Wulf engineers had to design one pipe with a separate outlet breaking the symmetry of the lower cowling. 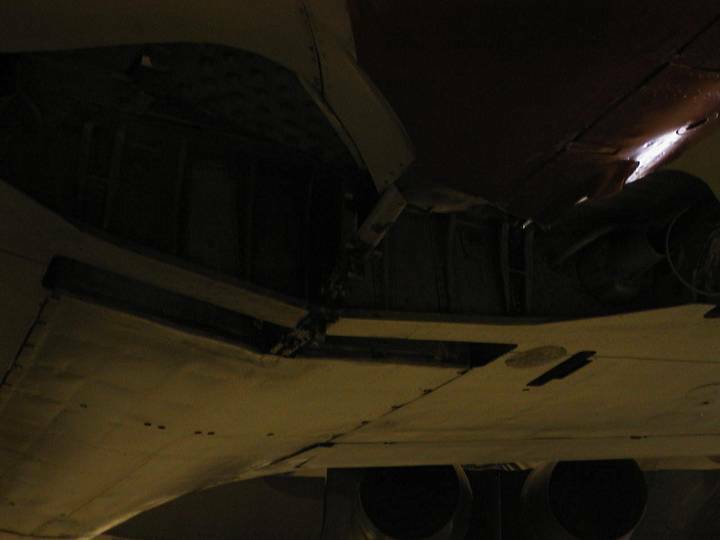 Such concentration of exhaust pipes lead to the excessive staining of the fuselage in operational conditions. 13mm MG 131 bulged cover. Heavy machine guns in this position were introduced with the A-7 model, earlier aircraft being armed with a pair of lighter MG 17 guns. The gun throughs, which would be quite prominent on an armed A-8, have been faired over on this aircraft after the guns had been removed. The removal may have taken place post-war, but also during the operational life of the aircraft. 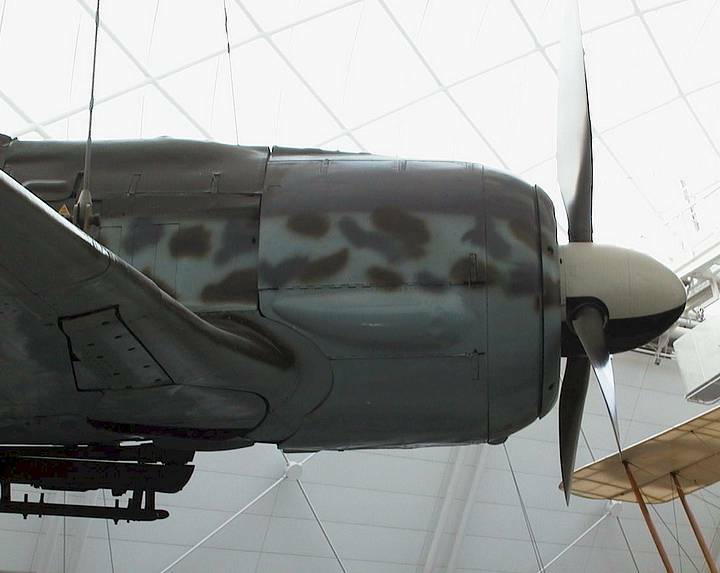 As mentioned before, this plane was adapted for Mistel composite, and Fw 190 flown in this configuration often had their cowling guns removed to give room for an extra oil tank required for long-range flights. 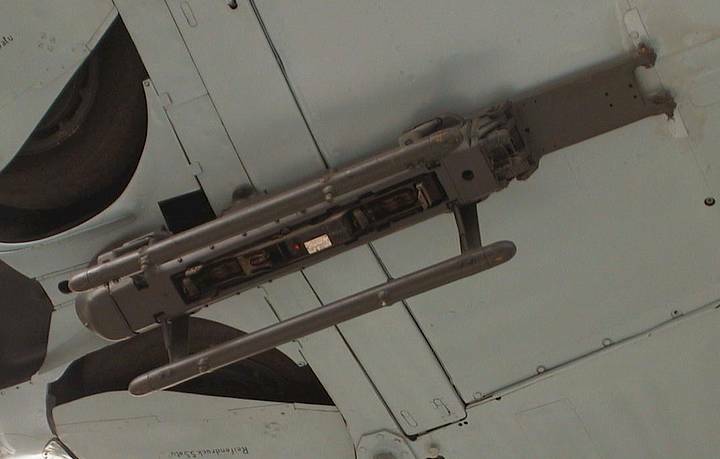 Close-up of the Mg 131 housing. Note the generally loose fit of this cover. The A-8 had a pair of wingroot-mounted MG 151/20E 20 mm cannon. These were first introduced with the A-2 model and remained standard armament for the remainder of the fighter’s development. The cannon was belt-fed. 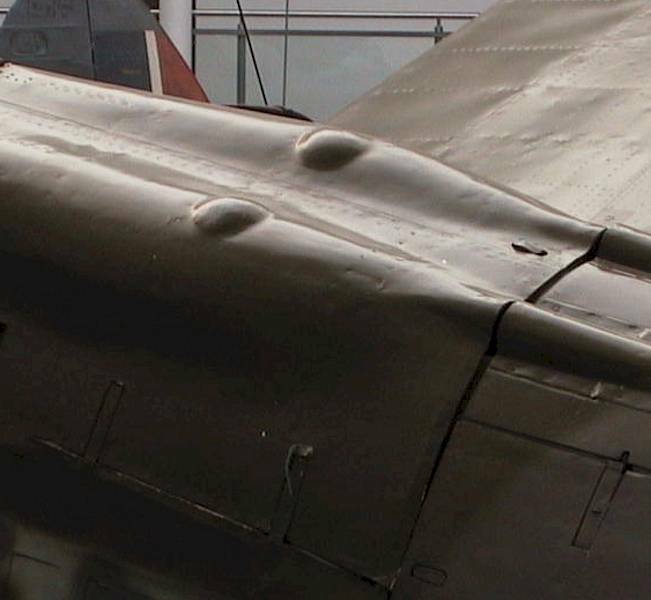 To clear the canon breeches, bulged blisters were added to the upper wing armament hatches. These were triangular in cross-section as can be seen here. The canon on this example has been removed, and the opening in the wing leading edge covered with aluminium plate. 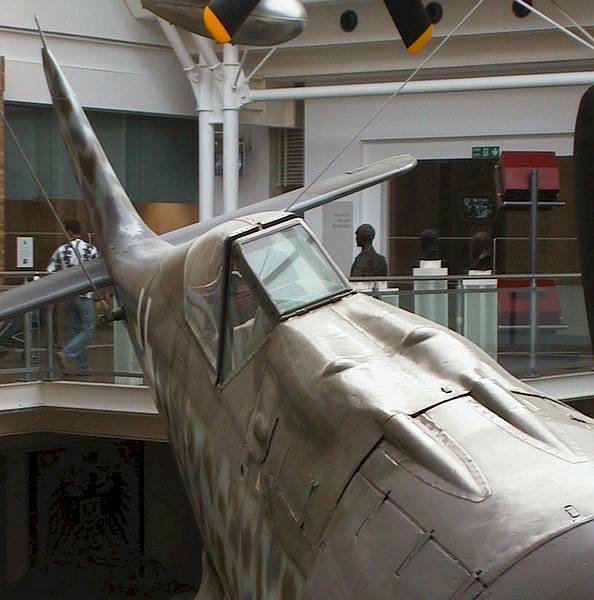 Hendon’s Fw 190 F-8 with its cannon retained displays how the barrels of the MG 151 protruded through the wing edge. The barrels also went straight through the wheel well, and were clearly visible inside. 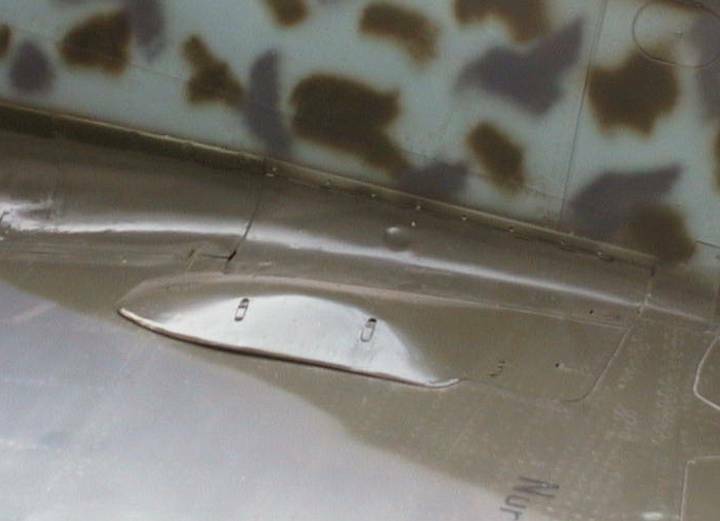 The same MG 151/20 blister at the wing root was part of a hinged cover opening upwards and inwards. The ETC 501 was a universal rack able to carry a bomb or an extra fuel tank. However, the lengthwise braces were used with drop tank only, to provide better longitudinal stability of the tank. 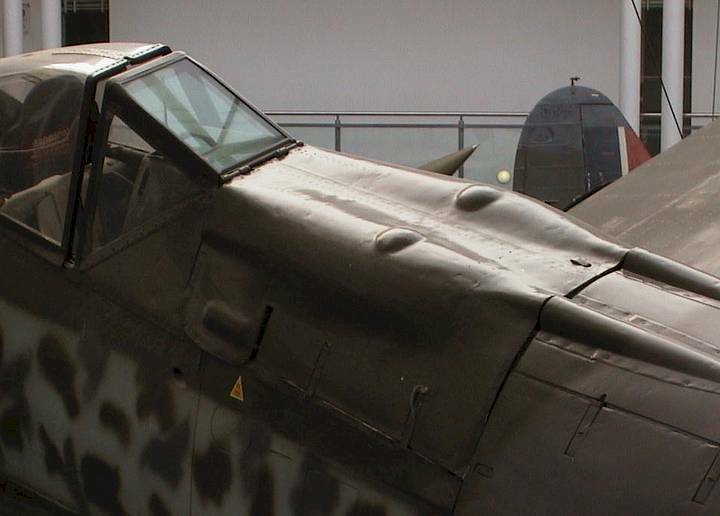 The ETC 501 rack is complete, but most period photos show rack-equipped Fw 190s with an extra aerodynamic fairing behind it. The fairing is missing on the IWM machine. The reason for this could not be determined. The ETC rack was positioned 8 inches back as compared to this view on all models prior to the A-8. 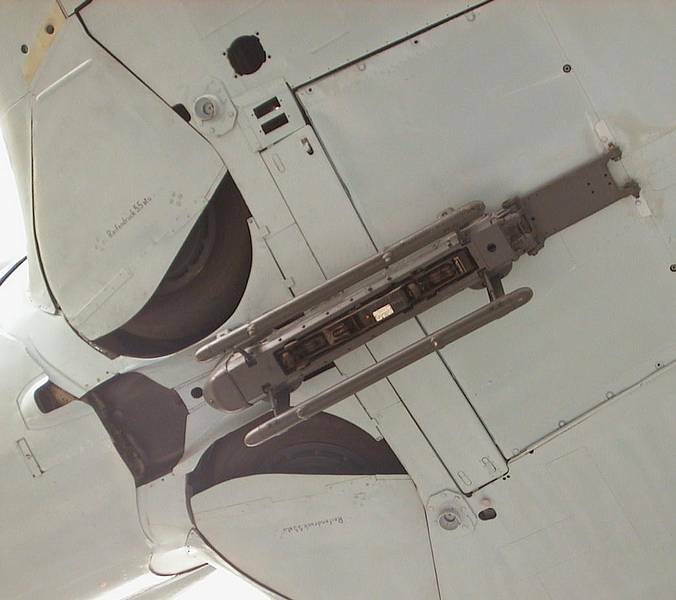 With MW50 installation and a new fuselage fuel tank aft of the centre of gravity on the A-8 model, the rack was repositioned forward as far as possible to restore the centre of gravity. 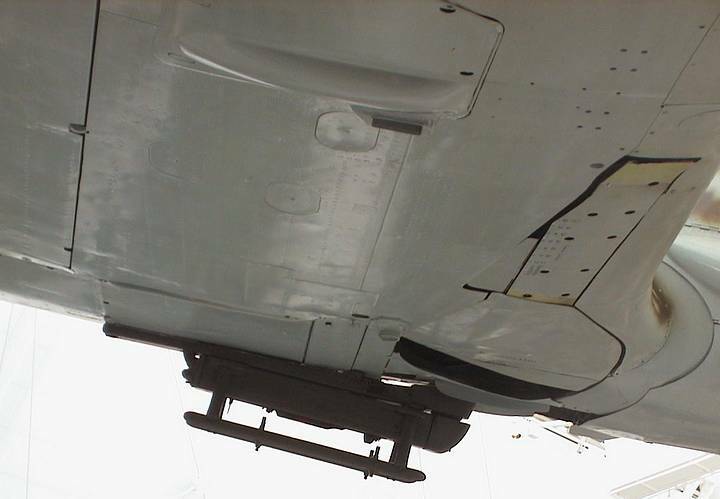 Here is the lower cover of the outer wing gun. As mentioned before, the featured aircraft is a Fw 190A-8/R6, and this picture also demonstrates why. The R6 Rüstsatz cvonsisted of one W.Gr. 21 rocket tube beneath each wing. This weapon was specifically targeted at Allied bomber formations. It was a popular conversion, in fact the RLM insisted that every second produced Fw 190A should be able to carry rockets. The unmistakable evidence that this is a R6 conversion is here in the form of eight mounting holes for the W.Gr 21 forward support braces, visible to the left of the photo. 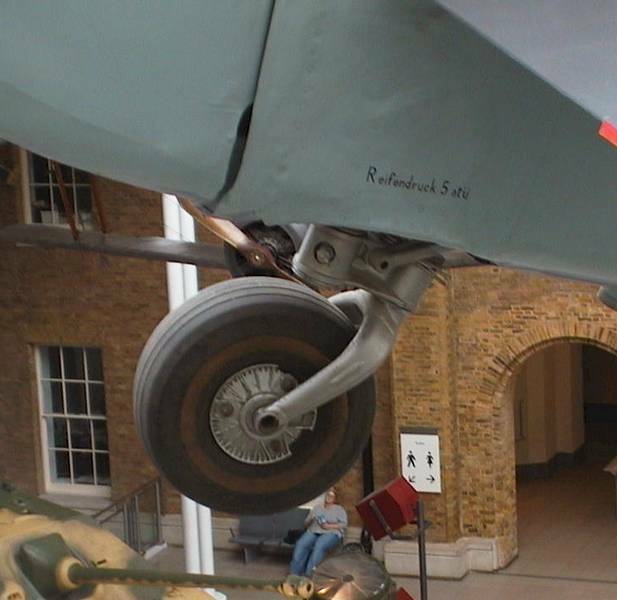 The extended undercarriage on the Hendon machine exposes the wheel with its ”solid” hub, introduced on later models of the Fw 190s for added strength to support an ever-heavier aircraft. 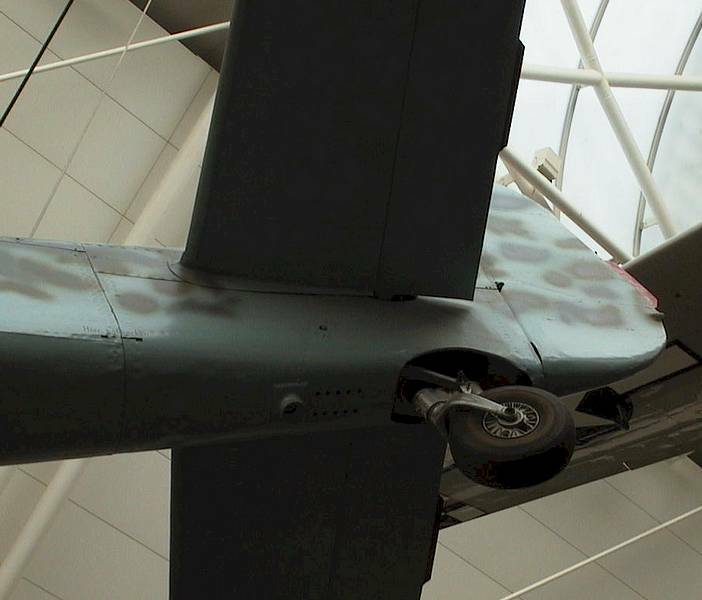 The wheels and undercarriage were identical between F-8 and A-8 models. Main tire dimensions were 700 x 175 mm. 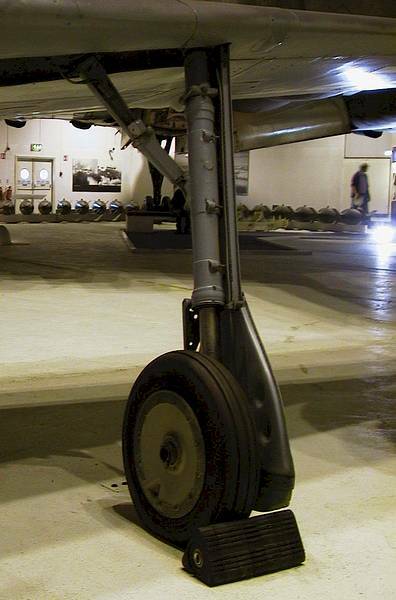 Undercarriage cover in the folded position. It is not clear to the author why the small flap at the trailing edge was made as a separate piece, perhaps it had something to do with the retraction mechanism. Close-up of the undercarriage cover. The nine holes clearly visible in this view are bolts holding the straps attaching the cover to the undercarriage leg. These were actually puttied over to a smooth surface at the factory, so it is very seldom they could be spotted on operational aircraft. The stencilling is a scale showing oleo depression rate on the ground. 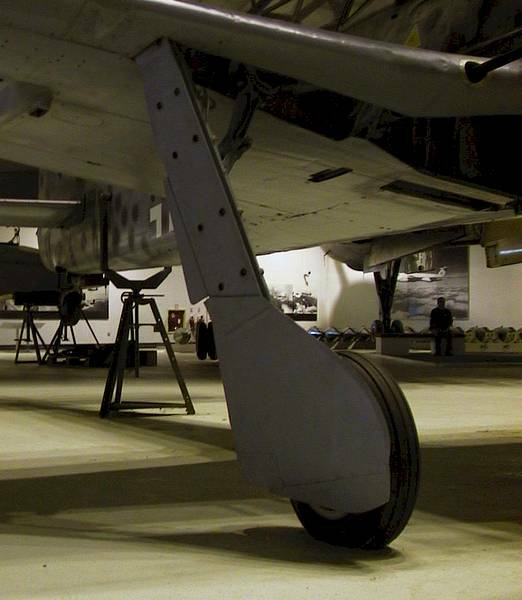 One immediately recognizable feature of a Focke-Wulf 190 on the ground was the inward rake of the undercarriage. Detail (albeit very dark) of the wheel well. Some elements are missing from this Hendon F-8: a small centre panel separating the two wheel wells, and the ammo boxes behind. Tire dimensions of the tail wheel were 350 x 135 mm. The wheel hub was cast in aluminium alloy (the casting has been damaged on this example). The tail wheel was partially retractable into the oval cutout in the fuselage. 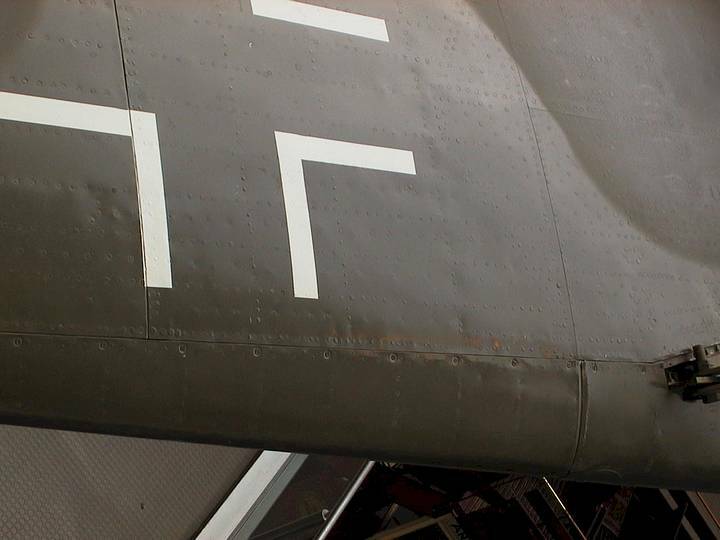 Two rows of holes in front of the wheel witness about this aircraft being flown in the Mistel configuration: these were the attachment points of a rear strut joining the Fw 190 with Ju 88 beneath. 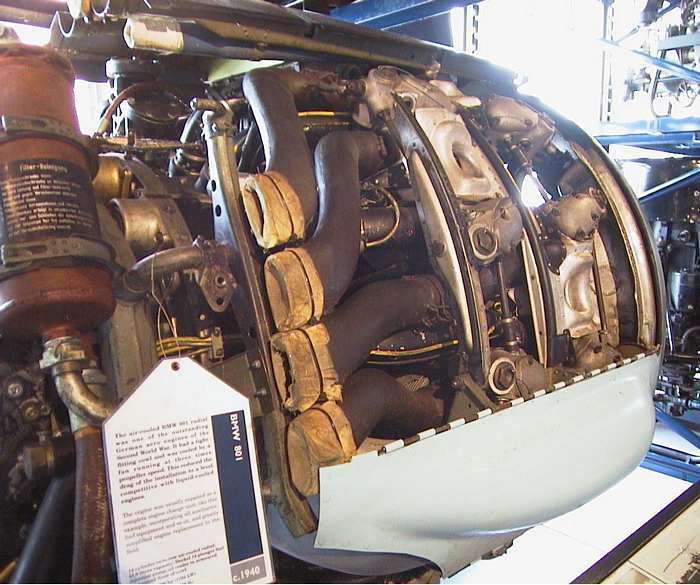 The BMW 801 engine sans propeller viewed from the front. This one resides in the London Science Museum. 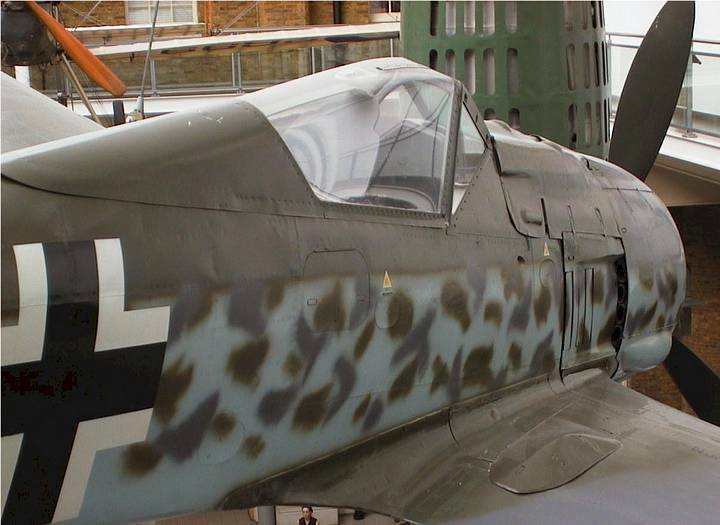 It belonged to a Fw 190 and is preserved in pristine condition, down to the original German paint on the cowling. The 12-blade fan can be seen to advantage. As mentioned before, the front ring of the cowling was an oil collector ring manufactured in one piece from pressed armour plate. 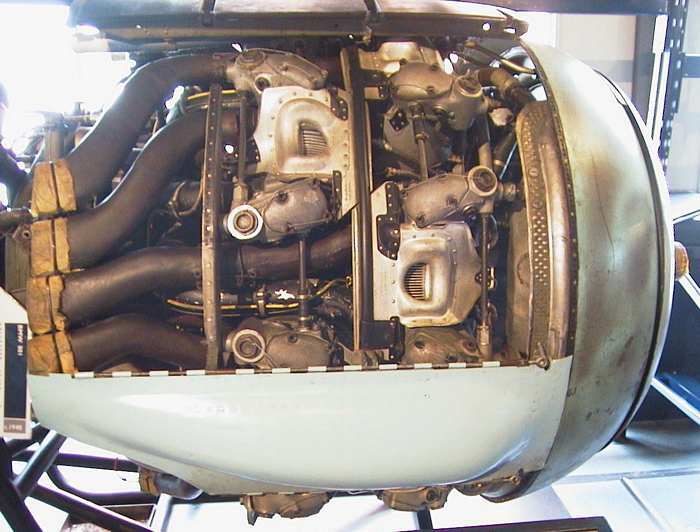 BMW produced these engines as complete units, with all accessories, exhaust piping, the cowling, fan and oil installation, ready to be bolted to the firewall attachment points of the aircraft. The resulting ”power egg” made the engine very easy to replace, also under operational conditions. The idea was not unique for BMW: the British Bristol Hercules is another example of the same design philosophy. The unit (including mounts) weighed around 1,250 kg and was 1.27 m in diameter, depending on the model. Removed starboard cowling panel provides a view of both cylinder rows. The engine had two rows of seven cylinders each, the bore and stroke were both 156 mm, giving a total capacity of 41.8 litres. The engine generated between 1,550 and 2,000 hp depending on the version. 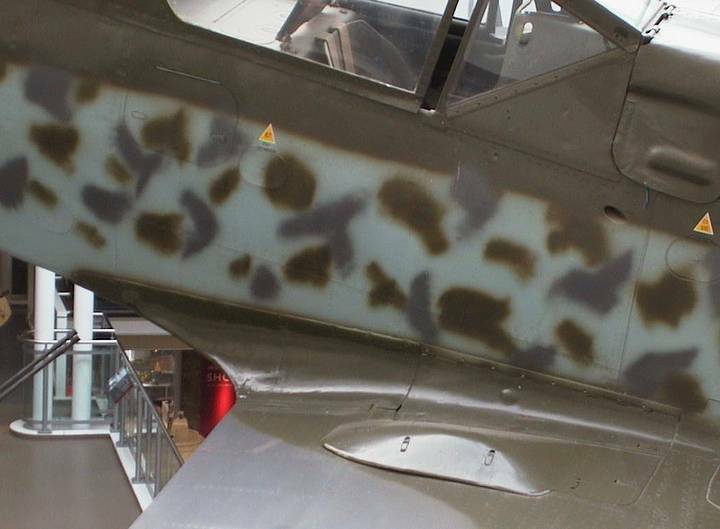 A painting detail worth noting is the rough finish of the grey mottling on the forward cowling, with plenty of spatter. The bulged panel at the bottom of the photo has been repainted fairly recently. The four exhaust pipes on the starboard side. The engine assembly viewed from behind. This photo shows the shape and colouring of all the accessories, plumbing and cabling. What can’t be easily seen among the accessories, however, is the revolutionary Kommandogerät. 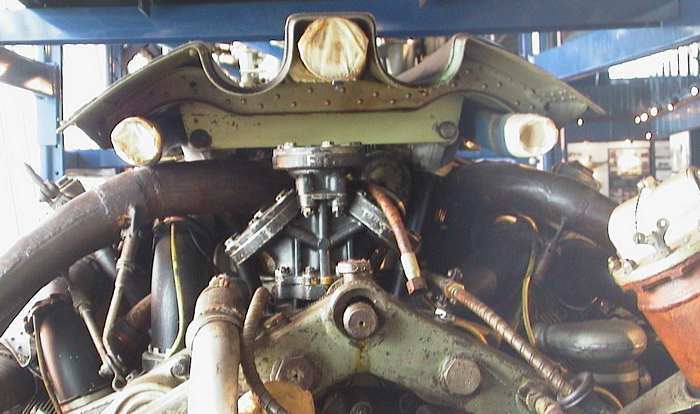 This hydraulic-electric unit allowed the pilot to operate fuel flow, mixture strength, propeller pitch and ignition timing by a single throttle control, dramatically simplifying engine control. It also cut in a second stage of the supercharger at the correct altitude. 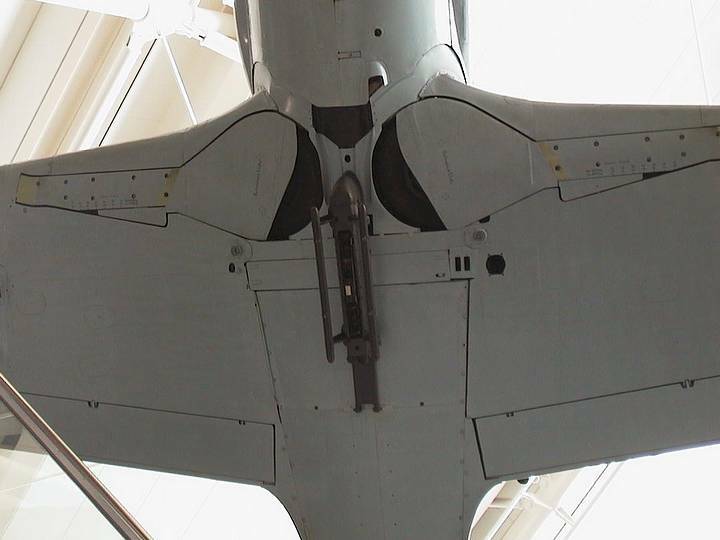 The top cowling panel, seen here from behind, features two recesses to provide a clear line of fire from the fuselage-mounted guns. 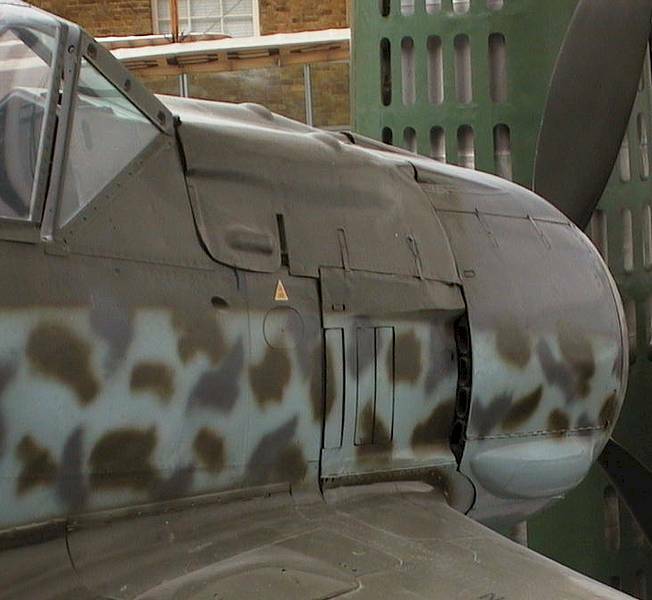 The presence of this panel is a proof that this engine had been attached to the Focke-Wulf fighter. The red-brow cylinder visible in this view is the oil filter. 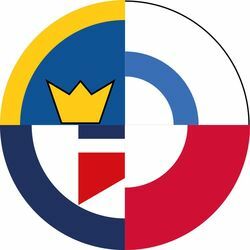 This article was originally published in IPMS Stockholms Magazine in October 2004.